Eastern National is proud to announce the 2018 winners of the annual Passport To Your National Parks® photo contest. The contest is open to National Park Service employees and Volunteers-In-Parks (VIPs). Ten photographs of national parks are selected and featured on the Passport To Your National Parks commemorative stamp set. Winning photographers receive a $500 award if the photograph is their own. If it is an NPS photo, the award is given to the park. Passport stamp sets have been issued each year since 1986. 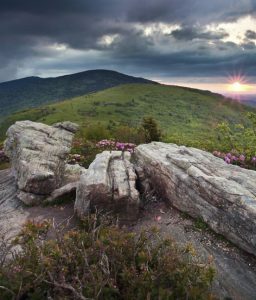 The 2018 National Stamp features the Appalachian National Scenic Trail in this photo by Brent McGuirt. The new stamp sets will be available for purchase in late November. To help get kids into the Halloween spirit, Eastern National hosted a series of craft activities at the Waite & Peirce store every Wednesday in October. 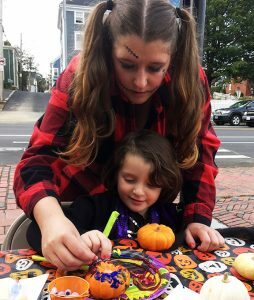 The Waite & Peirce store at Salem Maritime National Historic Site was the scene of Halloween fun for kids every Wednesday in October as part of Salem’s “Haunted Happenings” programming. Participation in these events is an example of how Eastern National is working with local tourism groups to help promote events and provide more interactive programming at our stores. What in the World Does Our America’s National Parks Warehouse Do? Front row (left to right): Mark Vineburg, Dave Hoffman, and Joan Yamrich, and back row (left to right): Tony Bello, Robert Clay, Stephen Drain, and Wayne Tidwell all contribute to the excellent customer service at the America’s National Parks Warehouse in Hatboro, Pennsylvania. Did you know that the America’s National Parks Warehouse provides excellent customer service to Eastern National’s stores as well as online and wholesale customers? That the warehouse staff handles transfers of EN-produced books and other non-book items to the sites? That the ANP Warehouse is the fulfillment center for eParks.com and ArrowheadStore.com? That wholesale fulfillment of EN-produced products to other associations and retailers is also handled at this location? Well now you do! Our friendly warehouse staff is always ready to help! They can be reached at 877-628-7275. 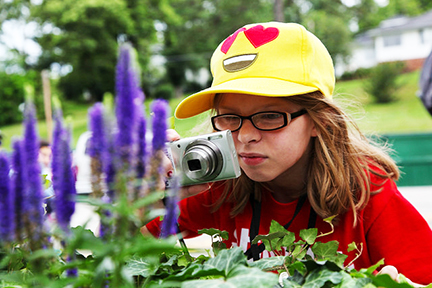 A young participant in the Parks in Focus® program. With support from an Eastern National Competitive Grant of $4,770 Obed Wild and Scenic River was able to purchase 30 digital cameras, memory cards, camera cases, and mini tripods for use in the Parks in Focus® curriculum-based youth photography program. These park-owned digital cameras are provided during ranger-led programs to help connect youth to nature through photography. Click here for more information on this and other examples of our funds at work.